Southwest Greens’ indoor courts are multi-purpose athletic courts and make great indoor basketball courts and game courts for tennis, badminton, volleyball, inline hockey, and more. Our home basketball courts are diagrammed and built to regulation basketball court dimensions and feature a state-of-the-art modular surface for better traction, performance and safety. Get a jump on an indoor sport athletic court of your own by consulting with the professionals at Southwest Greens, and enjoy fun in the great indoors! We’re ready to diagram and build your very own residential or commercial indoor modular surface court. There’s so much fun to have indoors, and Southwest Greens holds the key. Secure your court today! 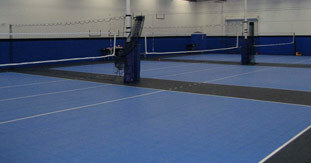 Let Southwest Greens diagram and construct a multi-game indoor court for you. Our home basketball courts are built to regulation basketball court dimensions, and our gym flooring is made from a unique modular surface perfect for so many activities there are literally too many to mention! Learn about our indoor basketball courts and gym flooring, and the possibilities available to you. Indoor basketball courts are just the beginning of your options at Southwest Greens. Our indoor courts define the term “multi-purpose,” and are perfect for everything from indoor volleyball and badminton to pickleball and countless other athletic endeavors.